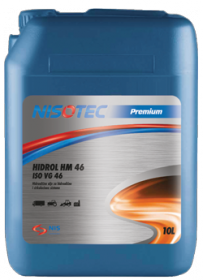 NISOTEC HIDROL HM are hydraulic oils formulated with high quality mineral oils and a stable system of zinc-based additives. They are intended to be used in most industrial hydraulic systems which require protection against wear and corrosion. They have excellent hydrolytic and oxidative stability. They are suitable for lubrication of other industrial equipment that requires oil with good oxidation stability and lubrication such as eg. less loaded gears and bearings.